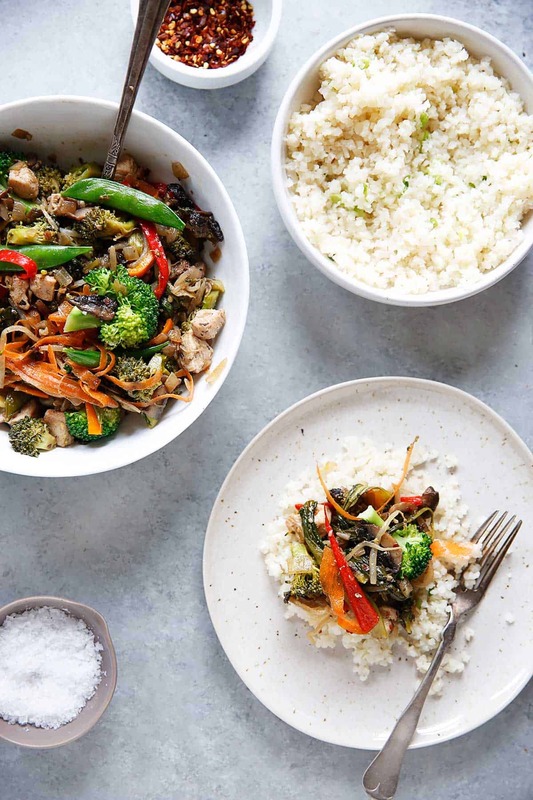 In a bowl, mix together rice vinegar, coconut aminos, chili garlic paste, and fish sauce. Set aside. Brown chicken on both sides, about 3-4 minutes each side. Remove from pan. Add onion, broccoli, red pepper and snap peas and cook until soft, about 8-10 minutes. Meanwhile make cauliflower rice: In a large skillet heat 1 tablespoon of oil. Add in cauliflower rice, seasoned vinegar, salt, and scallions. Let cook, stirring often, for 3-5 minutes or until the cauliflower starts to soften. Set aside when finished. To the stir fry pan add the garlic, bok choy, bean sprouts and carrots and cook for 1 minute. Return the chicken to the pan and add the sauce ingredients. Cook until the bok choy has wilted and all of the veggies are cooked through. Season to taste and serve hot with cauliflower rice. Top with sesame seeds.